Or is it “eat, pray, love?” I can’t remember. Anyway, here are a few things we have been loving across the internet lately…happy Friday! The beauties from the Wolf Circus jewelry collection. Krystal visited the showroom and I’m lusting after this gorgeous necklace. Nicole Warne’s (of garrypeppergirl Instagram fame) INSANE wedding in Australia, featured on Vogue. Our latest documentary obsession, Dirty Money on Netflix. Tax season Stromboli. Need I say more? I just signed up with a three-month contract at Pop Physique. What’s your favorite workout studio? Kind of drooling over Sweetgreen’s new spring menu. Thinking about what trips to Brooklyn and across Manhattan will look like without the L Train next year. Everyone’s obsession (including ours, pictured above!) with the amazing Tribeca shop, Let There Be Neon. That’s all for me! What did you love online this week? Have a great weekend. ← short suited + a closet sale! 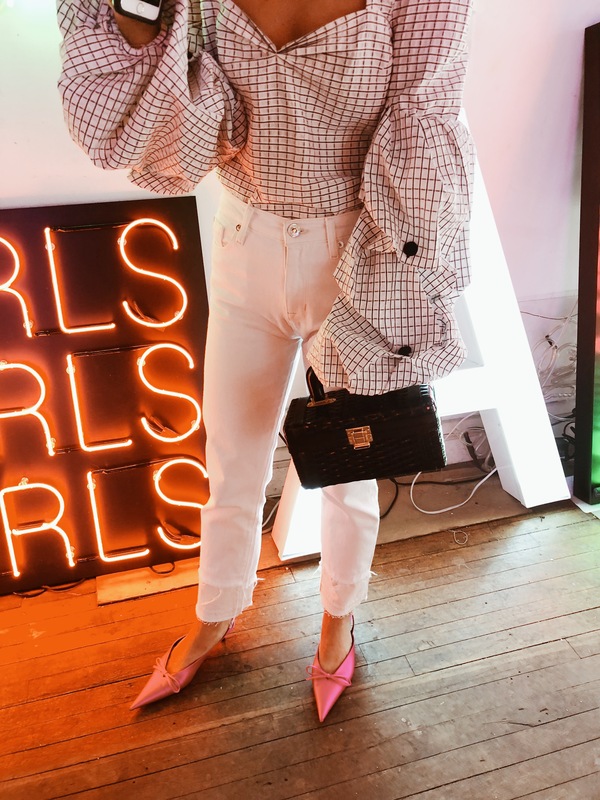 The blouse is a dream and also the shoes!